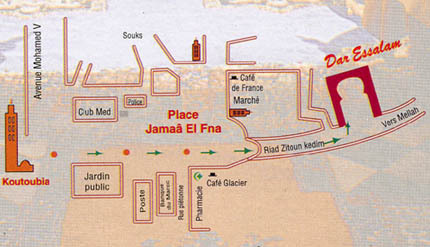 This fine restaurant was an authentic 17th century palace, which has been impecably preserved. You will be enthralled with the richness and stunning details of its interior architecture. The K'Dim Lounge is the oldest and includes refinements such as paintings, and plasterwork detailing its ceilings and alcoves. Alfred Hitchcock shot the film "The Man Who Knew Too Much" within this interior. Other dining areas include the Bahja Lounge (perfect for a party of 50), The Royale Lounge (seats 180 and includes a stunning coppula), and the Marjane lounge (seats 130 people and features an intricately detailed ceiling). 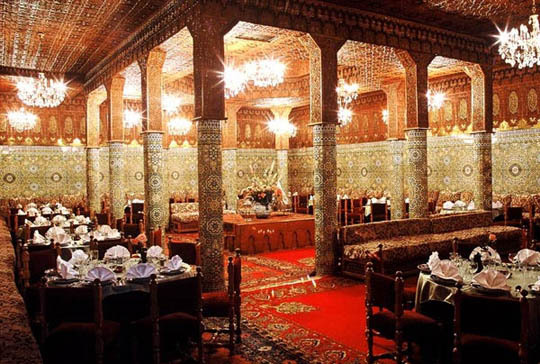 The meals prepared at the Dar Essalam are expertly prepared in the Harira Marrakesh style. Some of the gastronomical delights include: pigeon or chicken pastilla, m'hammer chicken tangine, tangine of chicken with lemon or olives; tangine of lamb with prunes and almonds or with olives, or conserved quinces, or peas and artichoke hearts; tangine berber style; couscous with seven varieties of vegetables, or with onions and raisins; and specialty dishes such as mechoui, marrakechi tangia and seafood pastilla which need to be ordered beforehand.